Think ghost stories are just for kids? Think again. Our haunted pub crawl is just for adults! Come join our knowledgeable and entertaining guides on an informative and humorous walking tour of Downtown Memphis restaurants, bars and taverns. You’ll enjoy the macabre history and spirits with the spirits, as we explore two types of Memphis traditions: ghost stories and alcohol. 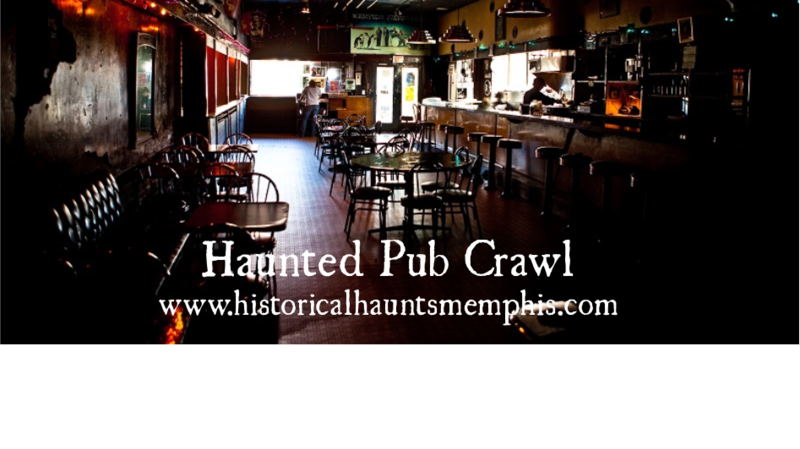 Enjoy the intoxicating tales of haunted Memphis on the Historical Haunts Pub Crawl. Your host for the evening will share historical tales and current paranormal experiences from the dark side of Memphis. We will make 3 pub stops and maybe others of interest along the way depending on time. Cash for drinks at the stops will speed things up! This tour is for ages 21 and older, no exceptions. We depart promptly and the tour runs approximately 2-2 1/2 hours. Alcohol is not provided or required. Please bring your ID– bars in Memphis may check ID regardless of age. We can also book your private group or tour for this entertaining and spooky event. Space is Limited! Book Early!